I've written before on this blog about tattoos in the Jewish tradition. In fact, my 2008 blog post explaining that it's only a bubba meisa (old wives' tale) that Jewish people can't be buried in a Jewish cemetery if they have a tattoo remains one of the most popular posts on this blog. Well, tattoos on Jews are back in the news (that rhymes). This time the story is about grandchildren of Holocaust survivors getting their grandparent's Auschwitz inmate numbers tattooed on their arm as a memorial. The article in the NY Times opens with the story of Eli Sagir who had the number 157622 permanently inked on her arm. That same number was forcefully tattooed on her grandfather's arm by the Nazis at Auschwitz 70 years earlier. Sagir's mother, brother, and uncle also had the numbers inscribed onto their forearms. According to the Times article, "tattooing was introduced at Auschwitz in the autumn of 1941, according to the United States Holocaust Memorial Museum's Encyclopedia of the Holocaust, and at the adjacent Birkenau the next March. They were the only camps to employ the practice, and it is unclear how many people were branded, briefly on the chest and more commonly on the left forearm." This new tradition is shocking, but some find it meaningful as a way to keep the story of the Holocaust alive as survivors are quickly dying off (there are currently 200,000 Holocaust survivors compared with 400,000 a decade ago). Some tattoo artists see the importance of this practice and don't charge for their services. The descendants of the survivors interviewed for the NY Times story all agreed that they wanted to be "intimately, eternally bonded to their survivor-relative. And they wanted to live the mantra 'Never forget' with something that would constantly provoke questions and conversation." There is a certain irony in this story because many parents forbid their children from getting tattoos based on the notion that Holocaust victims were forced to be tattooed. But I think tattoos are just a reality in the 21st century and the idea that Jews with tattoos will be refused burial in a Jewish cemetery seems to have been debunked. The practice of wearing a grandparent's (or great-grandparent's) numbers from Auschwitz or Birkenau as a tattoo should be embraced as a new ritual for this generation. Just as survivors' grandchildren asked them what the numbers symbolize, some day the grandchildren of the grandchildren will ask the same question. These tattoos will serve as a tribute to those who survived the Holocaust long after they die, as well as a memorial for those who perished. Not all use of the Holocaust number tattoos is for good however. Seven years ago during the Israeli army led pullout from Gaza, Israeli settlers compared their plight to that of Holocaust victims. The residents of the Gaza settlement bloc of Gush Katif wrote their identity card numbers on their arms in protest. According to an article in Haaretz, the trend began when a Gush Katif woman refused to show her ID card to security forces at a security crossing and instead "she showed him her arm, on which she had written her identity number, in a simulation of the Nazi practice of branding numbers on the arms of concentration camp inmates. Security forces checked her identity and let her through the checkpoint." Ehud Yatom, a Likud member of Knesset at the time, expressed his disdain over this practice. "The use by a few disengagement opponents of Holocaust symbols and implications comparing the horrors of the Third Reich to the government's disengagement plan, even if it is mistaken, constitutes a sin against the memory of the entire Jewish nation." Numbers tattooed on ones forearm will always be a shocking image because of the Holocaust. For that reason a friend of mine was horrified when she saw a commercial on ESPN for Quaker State engine oil. She described the commercial to me in enough detail that I was able to find it on YouTube. The Quaker State commercial shows several drivers who are proud of how many miles their car lasted while using Quaker State oil. 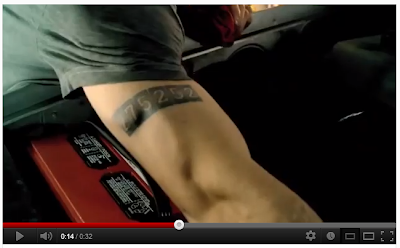 One man displays the number of miles his car survived with a tattoo on his arm. While I'm sure the company meant no disrespect to Holocaust survivors with this image (the tattoo is on the upper arm rather than where the Auschwitz numbers are usually found), it does show just how sensitive some people can be to that imagery. Here's a link to the commercial. As one daughter of a survivor who got her mother's Holocaust numbers tattooed on her arm articulated "The fact that young people are choosing to get the tattoos is, in my eyes, a sign that we're still carrying the scar of the Holocaust." If you are sharing with your readers news of a new cultural phenomenon, fine. If you are sharing your initial emotional reaction, also fine. But I am perplexed about how a blatantly anti-halachic statement like “The practice…should be embraced as a new ritual for this generation” can make sense from a Conservative rabbi, who views halacha as binding, unless there is some other contradictory teshuva also passed, or perhaps an addendum that addresses this issue. Please post your thoughts on this and/or any links to further sources so as to clarify this issue for me, as well as any other readers who may be curious.